AuthAnvil is a comprehensive identity and access management solution designed to help IT teams keep their networks, IT infrastructure, and devices safe and secure all the time, even during non-working hours. The software takes off the burden of managing end users’ passwords for the shoulders of your IT department, enabling them to devote more time on ensuring that your networks and services are all up and running and your data is fully protected. 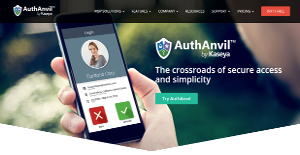 AuthAnvil combines password management and single sign on as well as multi-factor authentication capabilities, effectively taking out password problems that plague both IT admins and end users. Even with today’s advancements in the field of IT security, weak passwords remains a huge problem for IT security managers and staff. Poor passwords can be easily bypassed, resulting in leaks and breaches in the system that then lead to loss of data. AuthAnvil leverages multi-factor authentication and single sign-on to fully secure your IT infrastructure and safeguard your data while making sure that your users are verified prior to access. This robust identity and access management solution greatly strengthens your password protection capabilities and automate log-in. With AuthAnvil running in the background, passwords are automated and users can quickly access their accounts, files, systems, and more without having to remember their passwords. The software eliminates poor password practices and patterns that can be deciphered by expert hackers. AuthAnvil’s single sign-on capabilities allow end users to easily and securely access all their applications, including SaaS platforms by just clicking a single button. IT security personnel can see who has logged onto their systems, which applications they are using, and when these activities took place. This allows companies to competently meet their IT security standards as well as compliance rules and regulations set by government agencies. Since each enterprise has specific business requirements, it is advisable for them to abstain from seeking a one-size-fits-all ideal software application. Needless to say, it would be pointless to try to find such a platform even among market-leading software applications. The smart thing to do would be to jot down the various important factors that need consideration such as main features, budget, skill levels of employees, company size etc. Then, you should do your homework thoroughly. Read some AuthAnvil reviews and check out each of the other systems in your shortlist in detail. Such exhaustive research can make certain you reject ill-fitting platforms and select the system that presents all the aspects you require for business success. How Much Does AuthAnvil Cost? We realize that when you make a decision to buy IT Security Software it’s important not only to see how experts evaluate it in their reviews, but also to find out if the real people and companies that buy it are actually satisfied with the product. That’s why we’ve created our behavior-based Customer Satisfaction Algorithm™ that gathers customer reviews, comments and AuthAnvil reviews across a wide range of social media sites. The data is then presented in an easy to digest form showing how many people had positive and negative experience with AuthAnvil. With that information at hand you should be equipped to make an informed buying decision that you won’t regret. What are AuthAnvil pricing details? What integrations are available for AuthAnvil? If you need more information about AuthAnvil or you simply have a question let us know what you need and we’ll forward your request directly to the vendor.